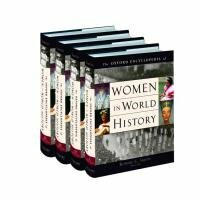 The Oxford Encyclopedia of Women in World History is a thoughtful, thorough and accessible survey of women in world history. The entries range from biographies to in-depth analyses with multiple subsections followed by a selected bibliography. connective, exploring the interactions among peoples through experiences such as migration and globalization.